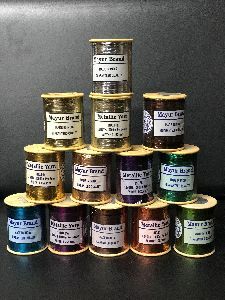 Color : Variety of Colour avaiable. Packing : Paper Cones with Net Wt. of 125 gms, 250 gms. Packaging Details : 100 cones of 250 gms each. Net wt. of 25 kgs per parcel. 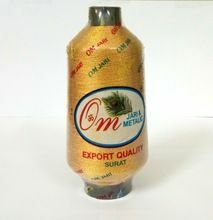 Packaging also done as per customer requirement. 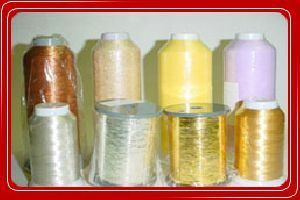 D. Bharat Kumar & Co.
We are the biggest manufacturer of metallic yarn in India with a monthly capacity of 1200MT. 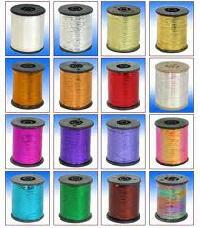 We are producing M-type, MX-type, STt-type etc. 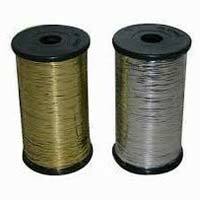 We are the only manufacturer of Pure SilverPure Gold Metallic yarn in India. 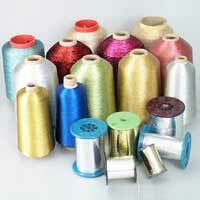 We are actively engaged in offering flora metallic yarn, which is made of quality raw material. 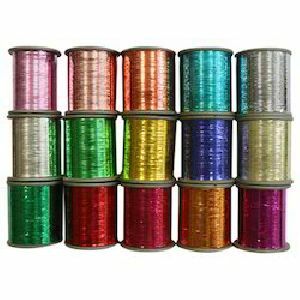 The metallic yarn is shiny and can be availed at very reasonable prices. 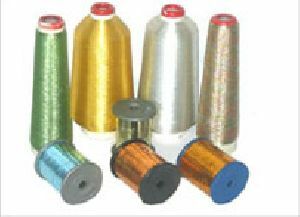 M – Type metallic yarn (12micron or 24 micron and any color) supported by nylon or polyester yarn (20D X 2 ends). One end is covered clockwise & the other end is covered counter clockwise. 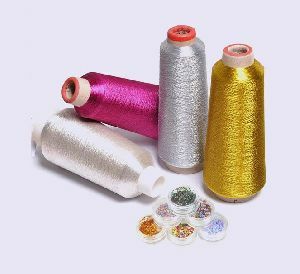 Application/Usage: This product is used in sweaters, knitwear, tricots, pre-dyed textiles weaving, embroidery, stocking, accessories, industrial subsidiary materials etc. 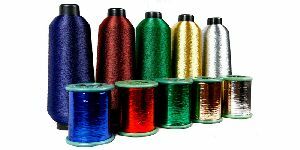 We are recognized as a paramount Manufacturer and Supplier of a wide range of Metallic Yarns in India. 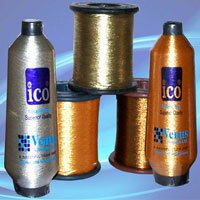 Metallic Yarns are made as per the international quality standards and thus are high in demand in the industry. 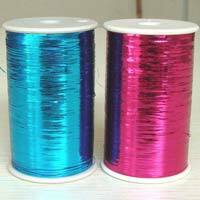 The Metallic Yarns can be availed from us in a wide range of colors and shades. 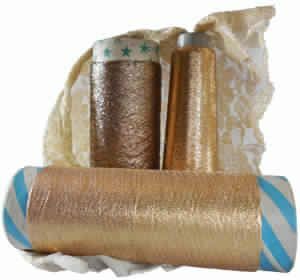 Metallic yarn is used for high quality sarees, suits, carpets, purses, leather items & many more. 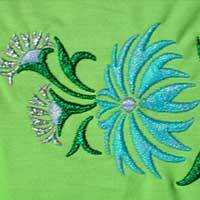 It can also be used for multihead and manual machine to make embroidery in fashion garments because of its smoothness. Available in both full cover (Jari) & half cover (Neem Jari). 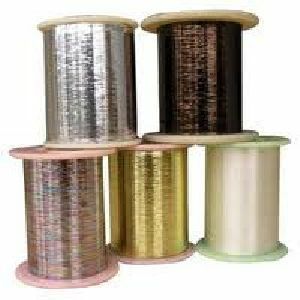 Mohan Thread Mills Pvt. 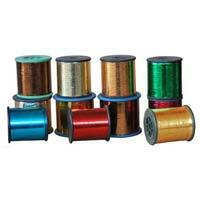 Ltd.
We have superior storage facility to keep large product range that we make available. In order to meet elevated quality norms, we keep it updated with modern work methods. Be it online payment or offline, we make possible for you to make trade transactions as per your convenience. We offer both offline and online mediums to make payment. 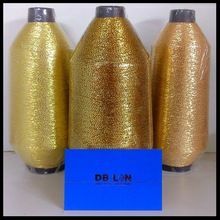 We are offering metallic yarn. 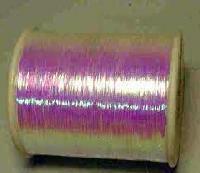 This is also called lurex yarn, 12 micron metallised film is covered with 30d polyester mono. 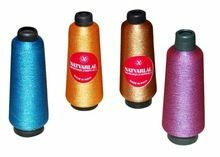 We present a qualitative range of Metallic Yarns that are made from good quality fibers. 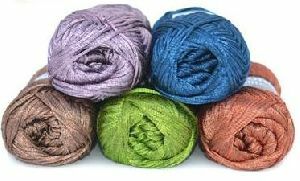 Known for its high durability and strength, silver yarns are widely recommended by customers. 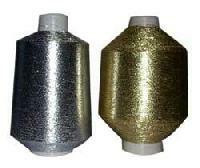 Available in different colors, Silver Metallic Yarn is used in assortment of garment industries. 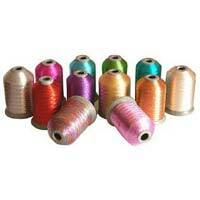 We provide availability of Metallic Yarns in different quantities and lengths suiting to the preferences of customers. 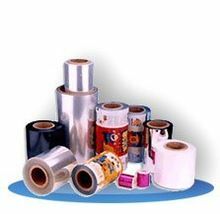 Polyester Film Metallised and Lacquered Which is the Basic Raw Material is First Silted Into Small Rolls and These are Further Taken Into Slitting Machine and Covered Into fine Narrow Strips Which is Called Metallic Yarn and is Being Used in Quantity By Various Weaving and Processing Units. 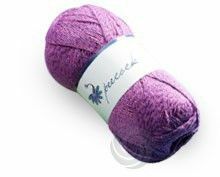 this So Called Yarn is Wound On Plastic Bobbins and Bears Various Shades/colors. 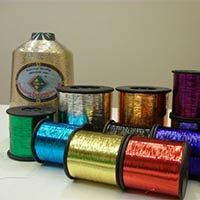 We manufacture metallic yarns in various sizes and cuts in all the colors. 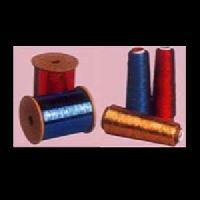 These yarns are highly demanded in the market for their effective usage in textile & other related industries. 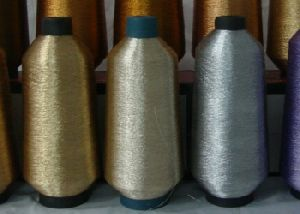 The major use of metallic yarn is in the production of zari kasab. 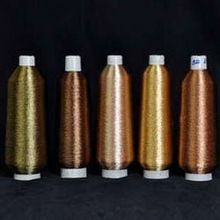 WE CAN PROVIDE SPECIALIZED YARNS: Metallic Yarn, ST Yarn, M-type Yarn & Yarn Grade Film We manufacture several grades in Metallic Yarn & also can provide YARN GRADE FILM, so if you tell us the exact application, we can suggest you the best grade to be used. M. B. Metayarn Pvt. Ltd.